A recent article by Doris de Guzman in the 05 March 2001 Chemical Market Reporter "Hemp Oil Shows Huge Gains In Food and Personal Care" analysed the small and developing market for hemp oil in North America. De Guzman refers to industry sources placing growth at a respectable annual growth at 20 percent. Growth is cited as a result of hemp oil emerging reputation as a therapeutic oil - resting on its high PUFA and EFA content. The article identifies Canada as the world's major producer of hemp oil, while the United States is the biggest market. The article pegs the total global consumption of hemp oil at 150 tonnes a year. Wholesale prices for refined hemp oil are quoted at "$8 per pound" while unrefined hemp oil, which is mainly used in food and supplement industries, is quoted at "$5 to $6 per pound". High prices are cited as one factor preventing hemp oil from entering the industrial oil mainstream. Other factors include ignorance, misinformation, and government interference. For more on the Chemical Market Reporter check out http://www.chemexpo.com/schnell/cmr.html. If you are looking for Organic hemp oil or Organic hemp seed this is the link to choose. We have produced the very best product at the very best possible price. Regina, Saskatchewan's BioHemp Technologies has sold its food division to Hemp Management Group (HMG) Sales and Marketing Inc.
Martine Carlina, the former Marketing Director of BioHemp and now President/CEO of HMG purchased the 'Mum's Original' line of certified organic hempseed products along with BioHemp's wholesale food accounts. Launching the brand name Mum's Original in April 2000, BioHemp developed a market of over 240 retail stores as well as a handful of wholesale accounts in just under a year. "The food line is really starting to take off, " says BioHemp's Jason Freeman (note: Freeman is co-publisher of The Hemp Report), "However the associated marketing costs and risks were enough for us to consider HMG's offer very seriously. As far as the strategic direction of BioHemp is concerned the sale of our food division will allow us to concentrate on feed and industrial applications of hemp". HMG Sales and Marketing Inc. acquired the food and ingredient division of BioHemp Technologies in March of 2001. HMG markets and distributes a wide range of certified organic ingredients including hempseed oil, dehulled hempseed, toasted hempseeds, as well as Canada's first certified organic line of products named Mum's Original which is sold in over 250 locations in North America. Newfoundland's Storm Brewery -- crafters of Hemp Ale and speciality ales Kyle Mild, Killick Pale and Raspberry Wheat -- has quietly become the first zero emissions microbrewery in Canada. According to Storm's Michael McBride, the goal of Storm Breweries as an eco brewery is to turn every waste product from the beer making process into a value-added product that can be sold. With a grant from National Research Council's IRAP program in 1999, Storm diverted brewery spent grain into a substrate for shitake and oyster mushrooms. Spent substrate has been refined into vermicompost for the gardening markets. While Storm is just beginning the marketing of its value-added products, its core business will remain beer. The microbrewery produces 10 hectolitres of beer a week. Hempola Valley Farms with HEMPOLA(TM) markets Canadian grown hempseed and hempseed oil products through national distributors throughout Canada and the U.S. and is North America's leading dedicated developer and marketer of hempseed derivative products. Product information and recipes may be obtained by visiting www.hempola.com or by calling 1-800-240-9215. Dr Jace Callaway, PhD, has been awarded almost $250,000 US in funding for clinical trials to investigate the properties of hempseed oil as a functional food. Tekes, a public funded company in Finland, will be sponsoring the trials conducted by Dr Callaway and his scientific team at the Department of Pharmaceutical Chemistry, University of Kuopio, Finland. The trials will begin on 1st March 2001 and will last for two years. Dr. Callaway says, "This study will look more carefully into the putative functional aspect of hemp foods, particularly in intervention groups, such as psoriasis and related skin problems, and also parameters of immune response." Dr Callaway has also recently completed the first human clinical health trials on hempseed oil. According to Callaway, this crossover trial compared hemp oil with linseed oil and involved 15 people, all healthy adults with slightly high cholesterol levels. The study was run in collaboration with the University of Kuopio's Dept. of Clinical Nutrition. Results to be announced by UK's MotherHemp in April 2001. Pour into a tall glass and enjoy. H.E.M.P. is actually two books in one - a duality personified as the Ying yang cover graphic suggests. Author Paul Benhaim, a founding partner of MotherHemp Inc, Britain's foremost cannabis corporation, has prepared a wonky Zen philosophical supreme court defence case for veganism, and of course, hemp food, nature's wonderfuel. It's all about Food, and we're talking organic food -- that body-mind-spirit stuff that affects our way of life, and as the author alerts us, has the potential to heal our minds. "My slant on the hemp lifestyle," he says in the introduction " is with new technologies and how they relate to ancient methods of cooking and healing.... to look at what seems to have lasted generations, not just years or months." "Many of my ideas and recipes contained within have been developed by my studies of ancient tribes and aborigines far removed from modern civilisation who never use aspirin, anti-acid tablets, a toothbrush or regular stimulants." "It is now time to slow down and watch what is happening to us as a society where mass change in consciousness is occurring." Mr. Benhaim, 29, is a laid back aggressive nutritional missionary preaching the benefits of natural food to his grease and spud munching island nation. According to an article in a mainstream British publication, he aspires to become the UK's first hemp millionaire. To do so he slugs it out 18 hrs a day to promote hemp food on the Internet. Who ever said the future was going to be any easier than the past? The generation coming into strength can't go back to the land, can't afford to play the farmer like their hippy dippy parents. Cities did not go away. The new people are committed to the urban circuit en perpetua. It's life under glass for millions -- the quality of air we breathe and the water we drink is questionable -- the last hope to maintain the warm cuddle of nature is to eat decent food. People are dead serious about living again. Edible Hemp almost doesn't make an appearance in the first half of the book. We get a recap of the orthodox hemp conspiracy theory ... zzzz ... hemp 101 for fibre, fuel, paper, and plastic parlez view -- and a cook's tour of holistic curiosities harking blunt yes -- no assessments of food combining, avoiding sugars, salt, processed food and cheap oils -- it's new, it's old, it's always a good idea to cut back on crap. A chapter saluting Naturecure -- attention to air, food, hygiene, sunshine and exercise traces its origins to an insightful 1930's British dentist who noted that Third World people had equally as good dental and mental health as the developed nations... It is all connected we learn, and its slow going getting to the hemp part -- it's a bit of a jog to graduate from DIY organic boot camp. Living forever takes a bit of practise. Some of the vignettes of hemp history seem a little fuzzy -- 3600 BC Egyptian papyrus mentioning Cannabis sativa is exaggerated by a few millennia, I am not aware of any Egyptian records citing cannabis, and myself and others have looked pretty hard -- "Calamus" in the King James Bible pointed to as a mistranslation of "cannabis" is perhaps second hand fanciful dope cloaking for an aromatic marsh plant common in many wetland regions of the world. It is a bit much somewhat pushing it, IMHO, overpainting a perfume fixative plant with mystical applications and blaming it on bad spelling by otherwise wise ancients. Life after spell check still requires logical skills. There is feasting, there is fasting, lunch in Heaven everlasting. Blessed THC is the least of our worries now. We are reminded there is an enzyme jungle out there before we get to the piranha pool of micronutrients, After being lead like lambs into the celestial cafeteria we are finally ready for part two -- thoughtful hemp recipes delivered with a fierce Zen zeal for the organic aesthetic. Part Two of H.E.M.P. 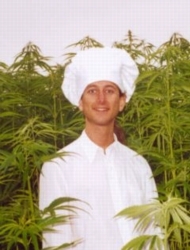 alone is worth the price of the book - Mr Benhaim has collected some very intelligent hemp food recipes and curiously, some smashingly good hemp soap formulas, hempen how to's for condiments and edible do dahs. Looking for elementary hemp food compounding ideas? This is a brilliant collection to start with, just about all any organic chef wanting to introduce hempism to a small natural food restaurant, or someone with a big holistic family to feed, would ever need to star. Smoothies, soups, breads, side dishes, sauces, spreads main dishes, desserts and sweets. That's a generous assortment right there. Some familiar standards, some rather new things and a few completely outrageous ideas. Some of these recipes are going to take a bit of bravery to attempt -- Beet flavoured hemp Halva I am not rushing to whip up no matter how bloody healthy it may be, seems like a Saturday Night Live Skit -- there may be leftovers-- but you'll never have to worry about " Mad Cow Disease.. However this may just be a transitional UK culinary cultural item to take the place of such time honoured UK dinner dishes as "Neeps and Bangers, Toad in the Hole and Kippers..." We colonials are not very sophisticated we must admit. We would have liked to have seen better use of the hulled hempseed in more of the recipes. It appears that this premium hemp raw material is not as well known in the UK as it is in North America -- or perhaps it is too expensive there for such generous rations as we are accustomed to in Voltaire's " few acres of snow. Here in Canada, home of the modern New World hemp industry, we are blessed with the best raw materials for hemp cuisine in easy legal abundance, and at reasonable prices. However our nation of fur trappers and buffalo biters has yet to produce a decent cookbook explaining how to use and enjoy our hempen bounty.... It is curious if not pathetic that our hemp client nations, the United States and Great Britain have both created exceptionally fine hempseed cookbooks to make best use of our hemp. We have strayed across the line of ignorance and into the broad vistas of stupidity. OK, we goofed some. In our last issue's Market Development Feature (http://www.hempreport.com/issues/15/market15.html) we mangled up the product description for HempNut's line. The errors in question have been corrected, and we offer our apologies to our readers and to HempNut's Mr. Rose, for any misunderstandings that may have arisen as a result. We also omitted Canolio Cosmétiques. Lucy Letorneau's new line of body products has caused some heads to stir in 2000, and certainly should be included in any market development wrap up. Ms. Letorneau, thanks also for your understanding. Beauty through Health, Traditional ways, Today's products: Canolio bodycare products are made with pure virgin Hempseed oil, which has a unique and rich EFA (essential fatty acids) profile. These EFA's, or good oils are vital for maintaining healthy skin. Canolio offers a Foamy Hemp Bath Oil, a Hemp Body Milk, a Hemp Massage Oil and Hemp & Orange Symbiosis Soap bar. ps; looking for more new products? We're saving them up for a future issue. Stay tuned. An Amazing, Delicious non-dairy 'ice cream'. Certified Organic and Kosher, Fairly Traded ingredients. High in Omega 3 & 6 and GLA, contains easily digestible protein. Available in Ontario Natural Food Stores (Eastern Canada in May). Check it out! The question shot forth across the packed hall. "How many people are doing worse this year than last year?" -- a few scattering of tentative hands rose up --maybe a dozen. "How many people are doing the same as last year?" Two dozen hands were raised this time. "How many people are doing better than last year?" A wave rose up, the balance two hundreds pairs of hands of most everyone else in the buzzing and teeming hall. Laughter and some cheers. Exuberance. This was the scene at the Town Hall meeting at the 20th annual confluence of Canada and North America's Organic Industry. Attendees certainly had a lot to celebrate. Growing consumer awareness, growing export businesses, growing SME's -- this is the fat wave that the Canadian and North American movement are riding right now. Organic retail sales in Canada hit h $674 US million in 1999 and are growing (International Trade Centre); the much larger US market is growing at 25% a year; and Europe is growing at a stunning 40% a year. Certainly a success at the gate (over 1600 people attended this year's event) even though it was a frozen Ontario weekend, attendees came from all over Europe, Canada and US. It was a good place to be. Now for the dark side. The organic sector has long seen itself as a movement, and success, new organic standards and rising need for international co-ordination is bringing challenges s that the industry may not be prepared for. The Townhall meeting was a chance for a panel of industry leaders to address this ambivalence. Speakers included Katherine DiMatteo of the Organic Trade Association, Bernward Geir of IFOAM, author Brewster Kneen, and The University of Guelph's own Dr. Ann Clark. The panel was moderated by Tomas Nimmo of Quality Assurance International. A concern that emerged from the Question & Answer formatted meeting was whether recent success would mean future peril. The opinionated Brewster Kneen, author of books like Farmageddon and Invisible Giant: Cargill and its Transnational Strategies as well as publisher of the Ram's Horn, is worried that the recent success of the organic food sector will in effect lead this sector down the garden path. What was once a cozy little industry, could be co-opted. "Be very careful..
A marketing representative from a national wiener company -- who was sitting nearby this writer -- put down his pen then and just listened. Geir knows that the money is out there. Citing 2.5% of the German marketplace is now organic; he knows the money is out there. "Money can kill an industry overnight, " he warned, "If you want to kill a movement, give them 100's of millions of dollars..
Geir offered his opinion that subsidies are dangerous, and do not necessarily lead to an incentive to change. It is his belief that subsidies have led to recent crises in food supply, like the much-publicised BSE. Geir also spoke of how research is better served in Germany, saying it's common for institutions to have an organic department. In Switzerland, there is an 85-person organic research facility. Ann Clark, from the University of Guelph - also the keynote speaker for the conference - announced that an organic course is finally being established at the University, thanks to a 350-student petition. The catch is, money is needed. Like other Canadian universities, organic studies at agriculture departments lag far behind the attention lavished on other agricultural paradigms. An interrelated hot issue raised at the forum regarded certification. As organic production captures market share, and organic food becomes less local and more global, standardisation is the wave of the future. The philosophy of standardised certification is viewed with mistrust with some in the movement, as they see it as organic food just becoming another part of the agri-business food chain. New USDA standards, developing Canadian ones and existing ones in Europe are putting challenges on a movement that wants to keep its identity while it finds itself mainstreaming. The night went on. The next day, the trade show floor was teeming. "Organic entrepreneurs can come and do business here -- both local and distance," says organiser Nimmo, cornered by he Hemp Report, "We have international representation -- OTA and IFOAM -- we have expertise. And so, how did hemp fit in? The Guelph show boomed for cannabis. This is an educated, sympathetic trade/consumer show and organic hemp is a good sell to this segment. All of the commercial vendors I spoke to (Cool Hemp, Ruth's and Hempola) felt they did extremely well. The Ontario Hemp Alliance was also there. David Marcus, Louise Hollingsworth and Gordon Scheifele showed me a hemp pulp sheet from Kenex. The OHA also has begun the process of planning a hemp and hemp history show at the Toronto Textile Museum. To go to Part 4, Fibre Front, click here.